[197 Pages Report] The energy-efficient windows market size is estimated to grow from USD 10.12 Billion in 2016 to USD 25.31 Billion by 2026, at a CAGR of 8.6% from 2016 to 2026. The base year considered for the study is 2015 and the market size is projected from 2016 to 2021 and from 2016 to 2026. The report aims at estimating the market size and future growth potential of the energy-efficient windows market across different segments such as glazing type, application, component, end-use sector, and region. The other objectives include providing detailed information regarding the main factors influencing the growth of the market (drivers, restraints, opportunities, and industry-specific challenges). It also aims to study the individual growth trends, future prospects, and contribution of various segments to the total market. The study also analyzes opportunities in the market for stakeholders and details of competitive landscape for the market leaders. The study strategically profiles key players and comprehensively analyzes their core competencies. The energy-efficient windows value chain includes glass manufacturers such as Saint-Gobain S.A. (France). Nippon Sheet Glass Co. Ltd. (Japan), Asahi Glass Co. Ltd. (Japan), PPG Industries, Inc. (U.S.), and SCHOTT Ag (Germany). Glass manufactured by these companies is used for manufacturing energy-efficient windows. The global market for the energy-efficient windows market is dominated by players such as Masco Corporation (U.S.), Builders FirstSource, Inc. (U.S.), Jeld-Wen Holding, Inc. (U.S.), YKK AP, Inc. (Japan), Ply Gem Holdings, Inc. (U.S.), BMC Stock Holdings, Inc. (U.S.), and Associated Materials LLC (U.S.). Other players in the energy-efficient windows market include Turkiye Sise Ve Cam Fabrikalari A.S. (Turkey), VKR Holding A/S (Denmark), Drew Industries Incorporated (U.S.), Inwido AB (Sweden), China Glass Holding Limited (China), Anderson Corporation (U.S.), Atrium Corporation (U.S.), Guardian Industries Corp (U.S.), Harvey Building Products (U.S.), Kolbe & Kolbe Millwork Co., Inc. (U.S.), Marvin Windows and Doors (U.S.), Pella Corporation (U.S.), Soft-Lite, LLC (U.S.), Ultraframe (UK) Ltd (U.K.), and Weather Shield Manufacturing Incorporated (U.S.). 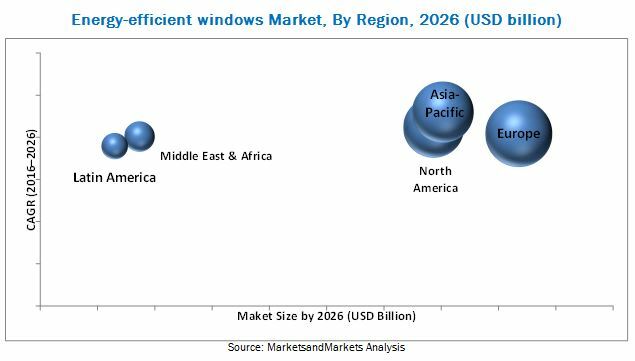 MarketsandMarkets projects that the energy-efficient windows market size will grow from USD 10.12 Billion in 2015 to USD 25.31 Billion by 2026, at an estimated CAGR of 8.6% between 2016 and 2026. The energy-efficient windows market is expected to witness high growth as a result of increase in adoption of green building standards, trend toward improving energy efficiency, and rise in popularity of heating, ventilation and air conditioning (HVAC) applications. The growth in trend of sustainable construction techniques such as zero energy building, energy-efficient building, and others, growth in construction industry, rapid urbanization and commercialization, and stringent government regulations are some of the other factors influencing the growth of energy-efficient windows market. This report is segmented on the basis of glazing type, component, application, end-use sector, and region. The double low-e segment, by glazing type, is projected to be the fastest-growing in the energy-efficient windows market during the forecast period. The gradual shift of building contractors and consumers toward cost efficient, eco-friendly, and modern building techniques is creating growth opportunities for the energy-efficient windows market. On the basis of component, the glass segment is projected to grow at a higher rate in the forecast period as it is the primary material in a window system to provide thermal insulation, thus ensuring maximum energy efficiency. The cost of glass is also expected to rise compared to other components used in the window system, such as frames and hardware. In terms of application, the replacement & renovation segment is projected to grow at a higher CAGR from 2016 to 2026. This growth can be attributed to the existing base of installed windows, which need replacement over the years. Also, growth in concerns regarding energy consumption and increase in trend of sustainable construction is also anticipated to propel the homeowners and building contractors to switch to energy-efficient windows for replacement purpose, majorly in developed markets. The application of energy-efficient windows in new buildings is also experiencing an upsurge due to stringent government regulations and building codes to meet energy saving objectives. In 2015, the residential sector accounted for a larger share in the energy-efficient windows market; this is projected to grow at a higher rate between 2016 and 2021, due to the extensive demand for window replacement, due to the thermal inefficiency and air leakage problems caused by ordinary single pane windows. The growth of residential construction across the globe is also creating growth opportunities for the adoption of energy-efficient windows. In 2015, the European market accounted for the largest share of the total market of energy-efficient windows, in terms of value, followed by North America. However, the Asia-Pacific region is projected to grow at the fastest rate in the energy-efficient windows market from 2016 to 2026. Markets in developing countries such as China, India, Brazil, South Africa, and countries in the Middle East are projected to grow at a higher rate from 2016 to 2026, owing to the high population in these countries, along with expected new building constructions and renovation activities in the next ten years. The global market for energy-efficient windows is dominated by major players of the construction glass and window & door industries. Saint Gobain S.A. (France), Asahi Glass Co., Ltd. (Japan), Nippon Sheet Glass Co. Ltd. (Japan), SCHOTT AG (Germany), and Central Glass Co. Ltd. (Japan) are the top five suppliers of window glass in the energy-efficient windows market, whereas, Masco Corporation (U.S.), Builders FirstSource, Inc. (U.S.), Jeld-Wen Holding, Inc. (U.S.), YKK AP, Inc. (Japan), Ply Gem Holdings, Inc. (U.S.), BMC Stock Holdings, Inc. (U.S.), Associated Materials LLC (U.S.), Apogee Enterprises, Inc. (U.S.), Deceuninck NV (Belgium), and PGT, Inc. (U.S.) are the leading windows manufacturers operating in the energy-efficient windows market. Other players in the energy-efficient windows market include Turkiye Sise Ve Cam Fabrikalari A.S. (Turkey), VKR Holding A/S (Denmark), Drew Industries Incorporated (U.S.), Inwido AB (Sweden), China Glass Holding Limited (China), Anderson Corporation (U.S.), Atrium Corporation (U.S.), Guardian Industries Corp (U.S.), Harvey Building Products (U.S.), Kolbe & Kolbe Millwork Co., Inc. (U.S.), Marvin Windows and Doors (U.S.), Pella Corporation (U.S.), Soft-Lite, LLC (U.S.), Ultraframe (UK) Ltd (U.K.), and Weather Shield Manufacturing Incorporated (U.S.). These companies use various strategies such as mergers & acquisitions, expansions, new product launches, and partnerships to strengthen their position in the market. 13.26 Kolbe & Kolbe Millwork Co., Inc.